Concrete retaining wall blocks are easy to install and ideal for building soil retaining walls, reclaiming sloped land, reducing erosion and even creating feature garden walls, planter boxes and veggie patches. Concrete masonry is durable, hard wearing and not prone to rotting which means you will have a long lasting wall. Adbri's retaining wall range is so easy to install, you can transform your backyard in just a weekend! Before you get started, make sure you do your research to make sure the job only needs to be done once. To help you out, we've put together an all you need to know guide to retaining walls. The most important part of the project is planning, as they say, if you don't plan, you plan to fail so don't skip this step. Choose your blocks. Keep in mind that different blocks will be better suited to different projects. If your project is over 1m high, double check with council as you may need approval. Walls that are near buildings, driveways, where large amounts of water or stormwater can build up generally need expert assistance. When in doubt always check with your local council to avoid any nasty surprises in the future. The footing is the most important part of your wall. Poor preparation may result in an unstable wall so before starting any blocking project, make sure the base is prepared correctly. Take the extra time to get the preparation right, if you start level, you'll finish level. Before excavating, decide what sort of footing /base will best suit your project. When it comes to the footing/base, there are 3 choices: a concrete foundation, a compacted crushed rock base or a Torpedo™ block base. 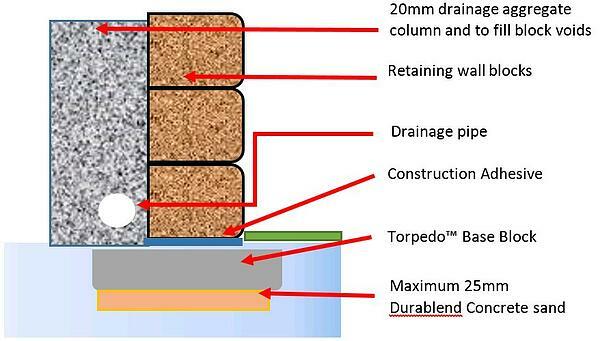 Compacted road base is most often used for standard gravity retaining walls. Spread the 20mm Road Base into the trench. Keep in mind that the depth of the road base will depend on the height of your wall. It may be as deep as 450mm. A concrete foundation would usually be used where soil conditions are poor or when exceeding the maximum unreinforced wall heights with an engineered design. When making a concrete pad, it is best to pour your concrete in one go. If the pad is poured in stages, left to partially or fully dry between pours, the concrete may crack at the join. A cracked base may cause stability issues in the future. The depth of your concrete pad is dependent on the height of your wall and may be as deep as 450mm and require steel trench mesh for reinforcing. The Torpedo™ Base Block is best suited to DIY projects as it is the quickest and easiest to way to create a level foundation. The first course of blocks will need to be secured to the base blocks with construction Glue. Using the marking spray paint, mark out the area where your wall will be installed. This will be your guide for when you start digging. Remember, the depth of your foundation will depend on the finished height of your wall. For small walls that are 1 or 2 rows high, dig the trench to a depth of approx. 100mm. To ensure adequate support and stability of your wall, the higher the wall, the deeper the foundation needs to be. The width of your foundations should also be excavated to at least double the width of your block. As per the diagrams above, lay your footing/base. Take your time in this step and make sure to get it right. A good level base will make it easier when you go to lay your blocks. Some varieties of the retaining wall system have capping. If your choice of block has capping, it will need to be secured down with a construction glue. Visit our website to order your blocks and get that weekend project started!